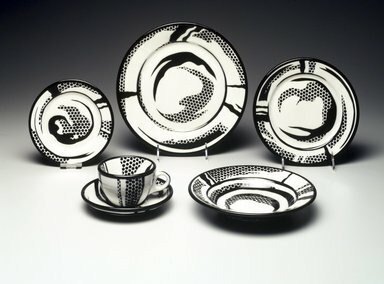 Artist:Roy LichtensteinJackson China Co.Durable Dish Co.
Cup (a) and saucer (b), glazed earthenware. Cup: deep cylindrical shape tapers towards bottom with C-shaped handle; white body with black decoration in abstract pattern of lines and dots with black rim, black line encircling base and along handle. Saucer: circular plate with sloping sides with impressed circle at center; white body with black decoration in abstract pattern of lines and dots. Condition: (a) Good. Some minor scratches. (b) Good with minor scratches and nicks.